If you’re looking for a natural stone look with a flat smooth finish, flagstone is the perfect material for your patio, walkway or retaining wall. Flagstone is a general term that refers to flat stones used in landscaping and construction. The stone is split into thin layers that make it versatile for a variety of construction uses. At Domenico Parravano and Sons, “Roman Style Concrete” is about more than just concrete. It’s about the craftsmanship we put into every job – concrete, brick or stone. 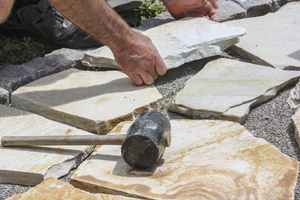 We’ve been hardscape construction, including flagstone, for homeowners in Baltimore City, Towson and Baltimore County since 1977. Flagstones are different from pavers in that they consist of natural stone cut into a variety of irregular shapes. Pavers come in a consistent shape, which can give a more artificial look than natural stone or flagstone. In addition to their flat surface, flagstones are also highly durable and have a semi permeable surface. Flagstones are available in a range of natural textures and shades.